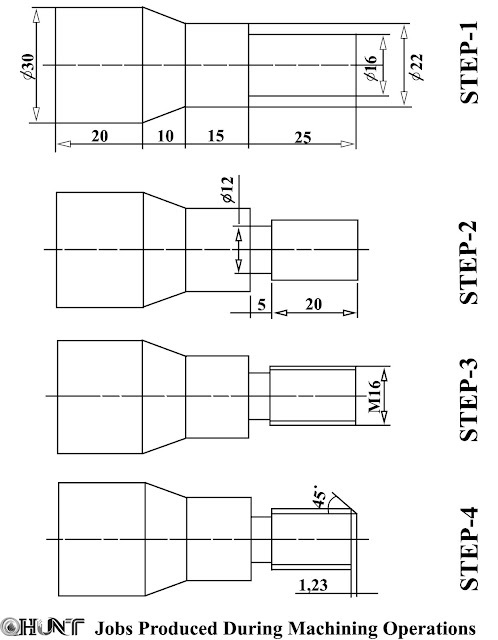 Before starting any machining operation, it is mandatory to plan the sequence of operation. Once the sequence is planned the same has to be fed to the computer. This activity is known as Programming. Any operation cannot be possible on CNC machines unless it has been programmed. The accuracy and the shape of the work piece depend on the quality of the programme written in the computer. It is already seen how various G and M codes are used. All the examples were designed with a view to explain specific G codes. In general, a job may require several of such machining operations which need to be performed in a proper sequence. The most efficient machining technique is to first give an overall final shape to the job (as far as possible) by G71, the multiple turning cycles or by G72, the multiple facing cycles. These cycles are invariably used for bulk material removal and often referred to as roughing cycles. However, it is not always possible to obtain the exact final shape with the help of these cycles only. For example, a part may have threads on it for which a threading cycle has to be used. Similarly, the grooving cycle will have to be used for grooving/parting operations. Moreover, both G71 and G72 suffer from the inherent limitation that they cannot produce any undercut on the job. G 73, the pattern repeating cycle, is the only cycle which can produce virtually any type of undercut, provided suitable tools are available which avoid undesirable interference. The thumb rule is to use G71 or G72 first, and thereafter, other cycles also may be used, if required. As already discussed, first G71 is used to give an approximate overall shape to the work piece (step-I). Thereafter, G75 is used to make the groove (step-2). Then, threading is done (step-3), and finally, chamfering is performed (step-4), completing the job. Step -2 and step-3 may be interchanged. Also, step-4 may be included in step-1 (recommended). It may be noted that G70 also has to be used to machine the extra material left as machining allowances by G71. 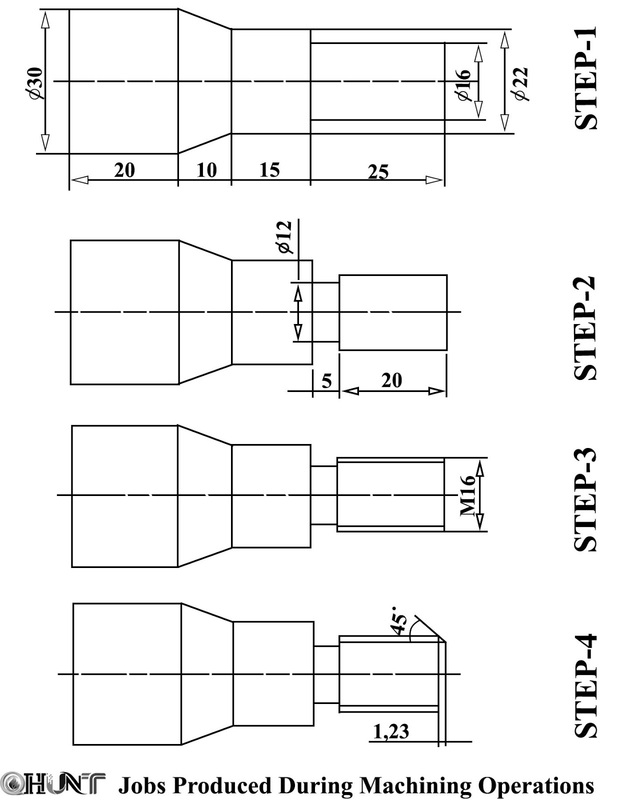 Sample lathe program is given in the following lines for the machining of the component shown in above figure. Thickness of the grooving tool assumed to be 2 mm and its leftcomer taken as the reference point.